Brother In Your Corner. ApolloBravo developed a digital promotion that seamlessly integrated a state of the art HTML 5 mobile web app and traditional Facebook app with our mobile photo sharing platform, allowing consumers to participate regardless of device. To enter, Jager fans uploaded a pic and shared their story. Two finalists were selected each week: one popular vote and one wild card. 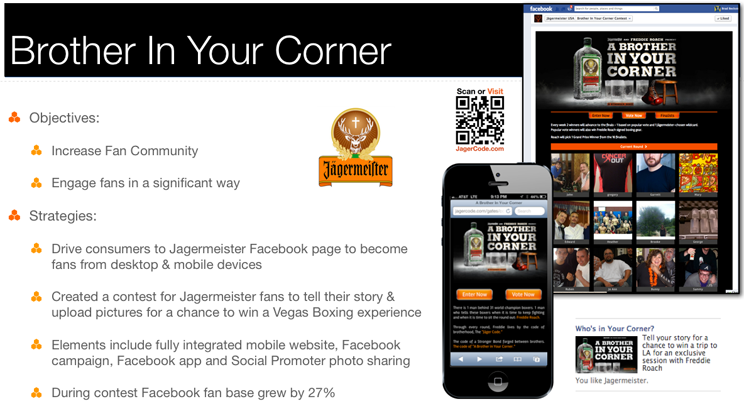 Jager fans shared their entry via Facebook & Twitter to get their friends to vote. The fully integrated digital promotion created quite a buzz and the grand prize winner traveled to Vegas for a once in a lifetime opportunity. ApolloBravo handled all elements of the promotion including sweepstakes preparation, winner confirmations, analytics and digital development.